How do you know that it’s Christmas season in Lockport? Is it the 42 inches of snow we got in the last four hours? Nah. Is it the beautiful decorations lining Main Street? Maybe. Most likely, however, it is the annual appearance of “Scrooge: The Musical” at the Historic Palace Theatre. Despite it being in the mid-50s the evening we went to the show, there was definitely a feeling of Christmas around the city. “Scrooge” has graced the stage at the Palace for fourteen years. If there’s anyone left in the City of Lockport who hasn’t seen it, they obviously must be a very small number. Even after a decade and a half, the parking lot along Walnut Street was almost completely full in addition to on-street parking. The place was packed for the Saturday night show. While I didn’t go to the Friday or Sunday shows, Wendy did, and she said the theater was full. That’s a great tradition. This is my fifth year seeing “Scrooge.” Honestly, how do you write yet another review of a show that you’ve seen so many times? It’s not easy. A couple of years ago, I wrote it tongue-in-cheek. The first review was serious, probably the most serious of the reviews I’ve done of “Scrooge.” So, this year, I’m not only going to talk about the performance, I’m going to talk about the lead up to the show. For the fourth year, at least one of the Bacon Bits has been in the show. What does that mean? It means from the beginning of November, through to the show, and beyond, the songs from the show are being sung. Endlessly. I’ve heard some of the songs so much over the past four years that I sang along to most of the songs the entire night when we were in attendance. And just because the show is over doesn’t mean the songs stop bursting forth. Today alone I’ve caught myself singing songs from “Scrooge” several times. This year’s performance was a little bit different than the previous years. 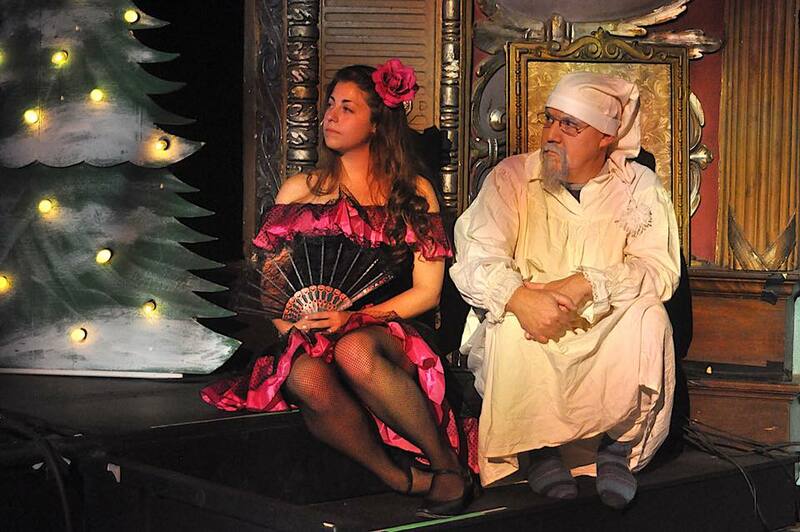 For the second year in a row, Jay Zimmerman has taken up the mantle of portraying Scrooge. Last year, he entered the role less than a week before the opening show. While he had been the understudy for some time, it was such a short, drastic change, that he didn’t have time to make the role his own. This year, he fixed that and made it memorable. With his goatee grayed with makeup and facial expressions that were more humorous than many of his singing lines, Zimmerman made Scrooge fun right from the beginning. Sure, Scrooge is supposed to be a curmudgeon. He does that. But when the ghosts start visiting, he gives Scrooge a little of that Zimmerman humor that makes Jay so fun, especially when the Ghost of Christmas Present cha-chas into his boudoir. He is also a great singer. When he sings about his former boss, Mr. Fezziwig, he simply nails it. Jack Landrigan and Kathy Dewey teamed once again as Mr. and Mrs. Cratchit. After the show, I asked Mr. Landrigan how many Tiny Tims he’d worked with over the course of his fourteen years. He figured it was about nine, and that while he was getting a little bit smaller, all the Tiny Tims were getting a little big bigger. This duo seems natural together after so many years performing with one another. They both understand the roles and have made them their own. I also never realized before that Bob Cratchit is a left-handed genius. It was the first time I’ve seen Bill Bernard on stage as he took on the role of Tiny Tim for the first time this year. I always enjoy seeing new talent show up on our local stage. He has a chance to grow up at the Palace and be part of the next generation of actors and actresses that we will be able to enjoy for years. 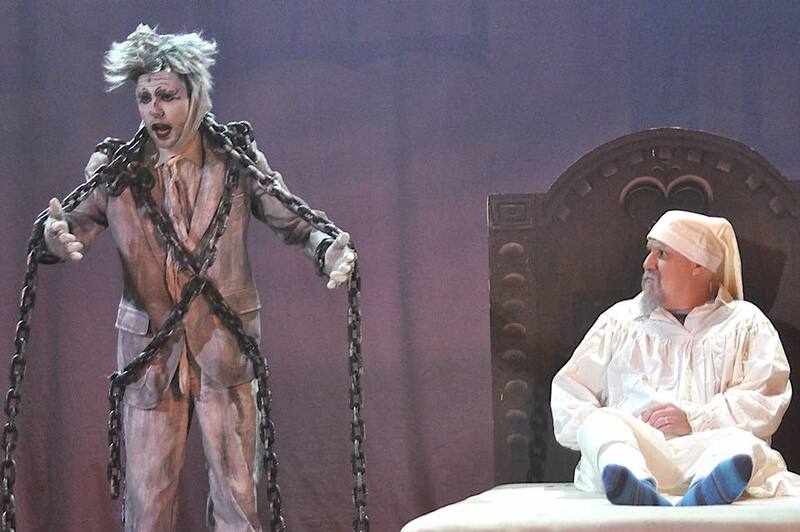 Robby Syruws is back again as Jacob Marley. For as long as I’ve seen the show, Robby has made his appearance as the ghostly apparition. Whenever he walks on stage as Marley, it seems like he’s perfected the floating walk. While he’s definitely firmly planted on the ground, it appears like he’s floating as he moves around Scrooge’s room. It’s amazing to watch. The one thing that almost no one sees, but endears Robby to my kids, is that he’ll read to them between appearances on stage. My kids actually look forward to Marley reading for them. It helps to pass the time and keep them calm while they wait for their moment. Angela Szafran and Rheanna Gallego as the Ghosts of Christmas Past and Present, respectively, are a bright spot on the stage. I am a big fan of Szafran’s singing, so it’s always a highlight for any of the shows I go to where she’s involved. Gallego’s happy, carefree smile makes her the perfect choice for the lighthearted image of Christmas Present. Her presentation was quirky and fun which fits right along with her personality. They were both fun to watch. One of my favorite actors with a great sense of humor is Bill Curr, or “Mr. Punny Guy” as my daughters call him. The story that came home with them was that he has some great puns that he likes to share. As Mr. Fezziwig, his genuine humor came shining through. He’s just a naturally funny guy and he is the perfect fit for the Fezziwig role. This was one of the songs that I heartily sang along with. Meghan Curr and Jake Hayes portrayed Scrooge’s young love and her new beau. As always the two of them sang beautifully. Jake has one of my favorite voices at the Palace. He sings so well. Juxtaposed against Curr’s singing, the two of them, along with Zimmerman, bring the first act to a rousing close. While we’re ready for the break, we, the audience, doesn’t want this moment to end. Let's not forget the pit. Mr. Fezziwig reminded us, "Let's hear it for Jeanette in the band." Of course, no musical at the theater can be complete without the live music performed by very talented musicians. All of them performed wonderfully for yet another show. True theater requires live music, and these musicians make sure the tunes are memorable. I sincerely hope they're not smoked out during the cemetery scene, though. 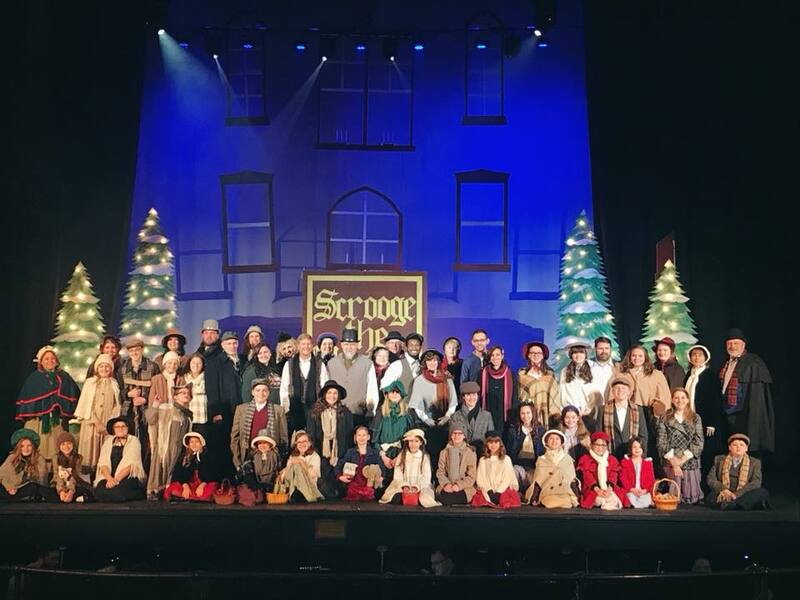 Next year will be fifteen years that “Scrooge” has graced the stage of Lockport’s historic Palace Theatre. Some people may say that’s too many years. For those who say that, they’ve never seen the show in all its splendor. And they are definitely in the minority. Judging by the continuous, sold-out shows, this musical will be a tradition in our city for years to come. For those who haven’t made it to a performance, you need to mark the first weekend in December, 2018 on your calendars. Get your tickets early. They don’t last long. Craig Bacon is not a big fan of the holidays, but there is something about the finale at “Scrooge” that fills him with joy and wonder. It is an experience that is hard to duplicate.